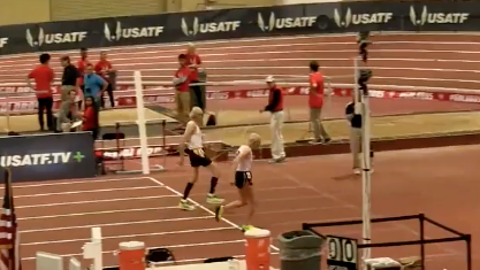 It was a nonagenarian race for the ages — a 60-meter dash between a 99-year-old and a 92-year-old at the USATF Masters Indoor Track & Field Championships in Albuquerque, New Mexico, on Feb. 18. Young upstart Dixon Hemphill, a 92-year-old retired businessman from Virginia, took a considerable lead from the get-go. … and take over his younger competitor in a thrilling photo finish. Rogers finished in 18 seconds. Hemphill: 18.05 seconds. According to Runner’s World, this is Rogers’ fourth straight USATF Indoor Championship 60-meter race win over Hemphill. “I think had I leaned a little bit, I would have won,” Hemphill told Runner’s World after the race.